BACKGROUND: A cleft lip (CL) is a congenital abnormality resulting from failure of union of the medial and nasal prominences with the maxillary prominence during embryonic development. CL may be classified as incomplete, complete, unilateral, bilateral or median. It may be associated with a cleft alveolus or a cleft palate. 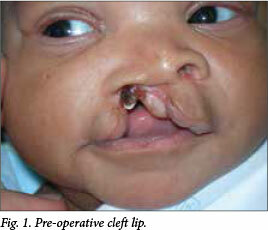 Definitive correction of a cleft lip is by surgery. In most African settings, the birth of a cleft lip and cleft palate (CLP) baby is associated with witchcraft and ancestral spirits. The parents, particularly mothers, are stigmatised. OBJECTIVE: To repair CLs in neonates with difficulties in breastfeeding. METHODS: Non-syndromic term neonates referred to Polokwane Mankweng Hospital Complex (PMHC) from primary and secondary hospitals with CLP and difficulties in breastfeeding were prospectively admitted to the neonatal unit. Our breastfeeding team supervised and assisted them with breastfeeding. The neonates whose breastfeeding was found to be unsatisfactory were considered for neonatal CL repair. Those who breastfed adequately were booked for later lip repair as per the rule of tens and discharged. RESULTS: From June 2009 to March 2012, 60 children with CLP were referred to PMHC, including 36 neonates. Of these, 23 neonates were unable to breastfeed satisfactorily and were operated at a median age of 9 (range 3 - 28) days. The median weight was 2.8 (1.8 - 3.7) kg. The median haemoglobin was 13.1 (11.5 - 16) g/dL. CONCLUSION: Neonatal CL repair is an alternative for those with breastfeeding difficulties. Eagerness to breastfeed increased following the lip repair with subsequent improvement in maternal confidence and interaction with the baby. At follow up, weight gain was above the 50th centile on the road to health charts. Early surgery prevents exposure of CL to the public with highly positive possible outcome of decreasing the potential for stigmatisation. A cleft lip (CL) is a congenital abnormality resulting from failure of union of the medial and nasal prominences with the maxillary prominence during embryonic development. CL may be classified as incomplete, complete, unilateral, bilateral or median. It may be associated with a cleft alveolus or a cleft palate (CLP). Definitive correction of a CL is by surgery. The conventional timing of when to repair a CL is according to the rule of tens: when the CL baby is 10 weeks old, weighs 10 lb, has a haemoglobin of 10 g/dL and has a white cell count of 103 cells/L. In the interim period, the infant is assisted in feeding by the use of feeding appliances or by a specially designed feeding bottle. At Polokwane Mankweng Hospital Complex (PMHC), these appliances and special feeding bottles are not available. In many African settings, the birth of a CL and CLP baby is attributed to witchcraft and ancestral spirits. The parents, particularly the mothers, are stigmatised or may be accused of infidelity during pregnancy. [1-3] We do not have CLP support bodies like the Cleft Lip and Palate Association in the UK. Between January 2007 and May 2009, we successfully operated on 33 neonates with CLP that was causing difficulties with breastfeeding. These neonates were operated on our regular service delivery and teaching programmes. Thereafter, from June 2009 to March 2012, we operated on 23 neonates under a research protocol conducted by the departments of Clinical Psychology, Psychiatry, Paediatrics and Plastic Surgery of the University of Limpopo at PMHC. These 23 neonates are the subject of this study, which was approved by the ethics committee of the University of Limpopo and supported by a Department of Higher Education clinical research grant for the University of Limpopo. Advances in neonatal anaesthesia, intensive care and surgical management have made it possible to operate on CL babies in the neonatal period. Neonatal CL repair is no longer an unusual procedure and several series have been published to date. [4-9] A Medline search did not reveal any published neonatal CL repair series from Africa. Thirty-six neonates referred to PMHC with CLP and difficulties in breastfeeding were prospectively admitted to the neonatal unit (Fig. 1). Our breastfeeding team supervised and assisted them with breastfeeding. Neonates with difficulties in breastfeeding were prospectively included in this study (June 2009 - March 2012). Patients with congenital cardiac, renal and neurological anomalies, and premature and syndromic CLs were excluded. A total of 23 neonates were included and treated. Those infants (13/36) who breastfed adequately were discharged and booked for later operation as per the rule of tens. Neonatologists cared for these neonates until discharge. The paediatrician/neonatologist, anaesthesiologist and the plastic surgeon evaluated the neonates pre-operatively, and if they concurred on fitness for surgery (patient was full term, not syndromic, free from congenital heart and neurological defects) the patient was prepared for neonatal CL repair. Preparation for surgery included explaining the procedure to the parents and obtaining their informed consent, and obtaining blood for haematology and biochemistry as well as chest radiographs if required. Investigations such as genetics, heart and kidney sonography were done if indicated. Patients were transported to the operating theatre in a warm incubator. Intravenous access was established on the ward or just before intubation. Peri-operative monitoring was with eletrocardiogram, pulse oximetry, non-invasive blood pressure, precordial stethoscope and core temperature. Volatile induction and maintenance of anaesthesia was used on all patients. At the end of surgery, the oropharynx was inspected, and throat pack and any blood clots were removed. Blood loss was assessed. The patients were extubated when protective reflexes had returned and the neonate was fully awake. In the operating theatre, the surgery was done in the incubator with a radiant heat of 36 - 36.50C. In winter, heating was supplemented by a Bair hugger warmer (Bair Hugger 505, Augustine Medical, USA), and the operating theatre was prewarmed with an oil heater that was run throughout the procedure. After oral intubation, the lips and the face were cleaned with warm saline and draped with sterile towels. A castro verge caliper was used for measuring and a marking pen was used to tattoo the operating field. After tattooing, the CLs were infiltrated with 5 IU ornipressin (PRO-8) diluted in 10 ml saline. Adrenaline in an appropriate dilution was an alternative. 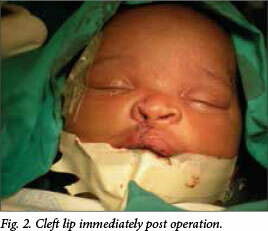 In unilateral clefts, a jelonet pack was placed in the affected nose to assist with moulding of the deformed cartilage. After operation, the neonates were nursed in a high-care ward attached to the neonatal intensive care unit (ICU) overnight. The mothers were encouraged to breastfeed as soon as the babies were fully awake; analgesia was effected with valoron drops (tilidine hydrochloride), 2.5 mg every 4 - 6 h for 2 days. Babies whose mothers were taking antiretroviral drugs were fed with milk formulae when fully awake, using medicine cups, cups and spoons. On the second day after operation, the dressings were removed and lip care was initiated. Data were expressed as median values and range using Epi-Info (CDC, USA). From June 2009 to March 2012, 23 neonates were included and had neonatal cheilo-plasty. There were 11 male and 12 female patients. The median age was 9 (range 3 -28) days. The median weight was 2.8 (1.8 -3.7) kg. The median haemoglobin was 13.1 (11.5 - 16) g/dL. Median birth position was 2 (1 - 5). There were 14 CLP, 5 bilateral CLP, 3 CL and alveolus, and 1 midline CL. Median age of the mothers was 21 (16 -38) years. Seventeen (72%) of the mothers were single and the rest were married. Two patients had wound dehiscence. One was minor and did not require surgical intervention. The other was a major dehiscence that required revision. Breastfeeding was restored to all 23 patients (Fig. 2). Mothers seemed very pleased at the sight of their repaired CL babies. There was increased potential for bonding as shown by the more natural cuddling, eagerness to engage the baby through increased baby talk and continuous eye contact. Early surgery prevented exposure of the CL baby to the public, decreasing the risk for stigmatisation. At follow up, weight gain was above the 50th centile on the road to health charts. All but two patients were discharged on day 4 after the operation. The patients were referred to PMHC because they had difficulties in breastfeeding. Breastfeeding difficulties in CLP babies have been reported widely in the literature. [10,11] The difference in our study population was that we did not have access to special feeding bottles and palatal obturators. In addition we did not have CLP support groups, hence the mothers in our study lacked psychosocial support. Solnit and Fajardo described that during pregnancy, mothers create a mental picture of the infant (a normal and healthy infant). If the mother then delivers an abnormal child, such as a CLP baby, the mother can suffer from shock, disbelief/ denial, sadness, self-blame, anger and anxiety. She may go into a mourning reaction for the loss of the imagined infant before she can bond with her baby. Kalland found that a child with a CLP could be terrifying for the mother. Could the difficulties in breastfeeding have been contributed by seeing a deformed baby (CLP)? Although our main reason for operating on these neonates was difficulties in breastfeeding, we also considered the plight of the mother and baby. Waiting for the CL baby to be 10 weeks old before surgery, especially if the mother is terrified by the sight of the CLP, is associated with poor nutrition, failure to thrive and poor infant-maternal bonding. [5-7,15,16] Advances in neonatology, paediatric anaesthesia and surgery have made it possible to perform CL surgery in the neonatal period. Many centres in the developed world have published series of neonatal CL repair. However, a Medline search did not show any publications on neonatal CL repair from Africa. We did not underestimate the complexity of neonatal cheiloplasty. In this study pre- and postoperative monitoring were done by the neonatologists. During the operation we minimised heat loss by operating in a warm incubator occasionally supplemented by a Bair hugger heating blanket.. Rapid induction and rapid-recovery anaesthetic was used on all our patients. This was to facilitate return of protective reflexes before a neonate was discharged from the recovery bay in theatre. The technique of repairing CL is the same in the older child as it is in the neonate. The development of fine surgical instruments, small size sutures, loupes precision haemostasis (especially with the Colorado diathermy needle) and the use of vasoconstrictors have made CL repair in the neonate easier. This study sample of 23 neonates without mortality and minimal morbidity has convinced us that neonatal cheiloplasty is safe; although the smallest patient weighed only 1.8 kg, owing to advances in neonatology, paediatric anaesthesia and surgery, low weight was less of a contraindication to surgery. Postoperative breastfeeding was good, as has been observed in other studies. Cuddling and eye-to-face interaction noticeably increased. Mothers showed more interest in their babies, a good sign of child maternal bonding. Neonatal CL repair is an intervention for CL neonates with breastfeeding difficulties. Breastfeeding ability was restored, with subsequent improvement in maternal confidence and interaction with the baby. At follow up, weight gain was above the 50th centile on the road to health charts. Early surgery prevents exposure of a CL baby to the public, decreasing the potential for stigmatisation. Acknowledgements. This study was supported by the Department of Higher Education via a clinical research grant of the University of Limpopo.